Jorge Luis Borges, the great Argentinian master of both philosophical and fantasy literature, of whom Nobelist J. M. Coetzee wrote: “He, more than anyone, renovated the language of fiction,” produced little visual art. After progressive deterioration of his eyesight, he went totally blind at 55. The only surviving work of which I’m aware is this primitive, appropriately fantastical rendering of a tiger. I include it because it is Borges’ and because of the meaning the tiger held for him. 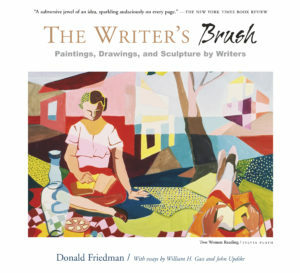 For more writer-artists, check out The Writer’s Brush: Paintings, Drawings, and Sculpture by Writers for more than 400 plates of artwork by great writers and the stories behind them.